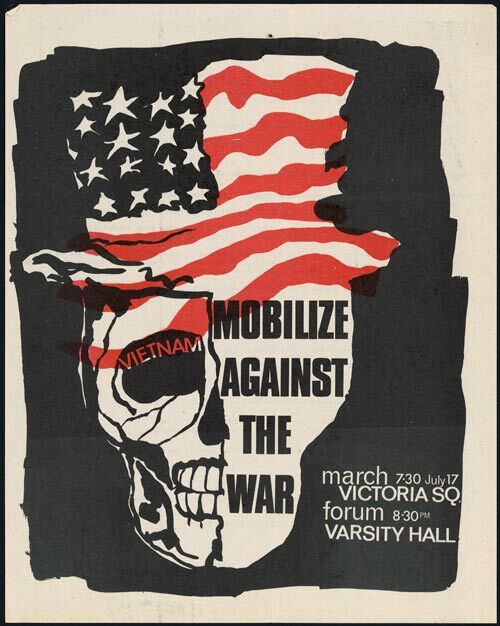 This poster from July 1966 advertises a march and meeting against the Vietnam War. Vietnam was the first of New Zealand's overseas wars to generate a sizeable anti-war movement. In previous wars there had been some opposition on pacifist, religious or socialist grounds, but war resisters were always a small minority. Anti-Vietnam War sentiment in New Zealand followed the pattern established in the US and Australia. Protests were small-scale at first, but as the war dragged on the opposition grew. Some protesters were pacifists opposed to all wars, while others objected to what they saw as US and New Zealand intervention in a civil war on behalf of an oppressive government. The use of weapons such as napalm against civilians reinforced this belief. Many opponents of the war began to argue that New Zealand should follow an independent foreign policy, rather than one tied to a superpower such as the US. Opposition to the war was linked with the youth culture of the late 1960s and early 1970s, and to causes such as the women's and anti-apartheid movements. While the majority of the population appear to have continued to support government policy, by the 1970s thousands were marching against the war.